Forest Road 99 starts about 18 miles from Mount St. Helens, approaching from the northeast. If the volcano no longer commands the southwest Washington skyline like it once did, having shed 1,314 feet of itself in the 1980 eruption, the 99 has a way of making you appreciate the landscape. Narrow and precipitous, it slows you down to speeds more conducive to observation, all the better for you to dwell on the spectacle of St. Helens whenever it appears around the bend. I had eyes only for pavement. I still had nine miles to go to the Norway Pass trailhead, where I was to meet my friend Carson, and I was late. The scenery blurred past. When I finally swerved into the parking lot, it was almost 8 p.m. There was one other car. A bearded and rather burly fellow perched on its hood, reading a book. He slid off and ambled over. “No problem!” said Carson, for he is inveterately good-natured. Oof. I set to packing. We planned to go for a three-day hike through the Mount Margaret Backcountry, which sits in the north-central portion of the Mount St. Helens National Volcanic Monument. Our loop was only 25 or 30 miles, and the forecast called for sun, so I wanted to travel light. Thus began a series of hard choices. Out went the tent, save for the ground cloth to sleep on. Out went my down coat. Out went a third of my bagels, the block of cheese, some extra socks. “You’re sure you’ve got enough?” Carson asked, hefting his own pack. “Almost,” I said. I opened the passenger door and considered two books in the front seat: In the Blast Zone, a volume of pieces by scientists, writers, and poets commemorating the eruption’s 25th anniversary, and Danger on Peaks, a collection of poems by Gary Snyder. I grabbed the Snyder and wedged it between my long underwear and sleeping bag. I tugged my pack zipper shut. The seams strained, but held. Good for them. You can always make room for a little poetry. Copyright c 2004 by Gary Snyder, from Danger on Peaks. Reprinted by permission of Counterpoint. whacked down, tumbled in the new ash wadis. the water dark as tea. angelic boys and girls, sleeping it off. — to really get right down on life and death. If you ask for help it comes. “Atomic Dawn” is from “Mount St. Helens,” a cycle of nine poems that opens Danger on Peaks. The first four are Snyder’s recollections of his early years with the mountain, before it reminded everyone it was still a volcano. The fifth, “1980: Letting Go,” marks that abrupt transformation, on May 18, when the entire north face collapsed, killing 57 people and leaving a mile-wide crater. The final four poems tell of Snyder’s return to the blast zone 20 years later. Taken together, they follow an arc of reconciliation, as Snyder weighs the idyllic mountain from his youth against the radically revised form he found as an older man. “Atomic Dawn” is the third poem in the cycle, but it was the first I had seen after I came across it excerpted somewhere. By the time I read the cycle in its entirety, “Atomic Dawn” had acquired its own resonance for me, having come dreadfully to mind in April 2010, when I climbed Mount St. Helens and learned on the drive home about the Deepwater Horizon oil spill in the Gulf of Mexico. I felt similarly enraged and helpless, and the irony of Snyder’s invocation to the purity, beauty and permanence of Mount St. Helens was doubly painful, amplified as it was in a world twice broken. But Snyder, just deeply changed himself, had been in desperate need of something stable and certain, and what seems more stable and certain than a mountain? What else, in the face of unforeseen catastrophe, are we to swear by? From the parking lot, the trail climbed quickly. Carson and I could see the beveled prominence of Mount Adams in the distance, but our immediate surroundings were equally arresting. We walked through evidence of earlier devastations, both human and geological: the clipped stumps from old clear-cuts, and the weathered trunks of trees knocked flat after superheated clouds of ash, rock, and steam roared over them at more than 300 miles per hour. The trunks lay in ordered patterns, like iron filings aligned to a magnet. A few remained upright as snags. Younger, living trees filled the patches between, having had the past 36 years to grow substantially unimpeded. I listened to our footfalls: not the usual soft pad on rich Cascade humus, but the light crunch of pumice. We reached Norway Pass after a couple of miles, and stopped to catch our breath, put on a layer and take in Mount St. Helens. The volcano was lit in wan rose, with a few gray snowfields left on its upper slopes. We could just make out the hazy chaos of its crater, ash and dust wafting from the wide, serrated rim. Beneath was Spirit Lake, a dense white mat of logs obscuring its surface. I would have liked to stay longer, to watch the mountain move from shadow to void, but Carson and I had four or five miles to go to our first camp. Stars were massing when we crested the hill higher up the trail and began the steady drop to the lakes that sit in the heart of the backcountry. As we made our way by headlamp, the slope came alive with the buzzings, chirpings and rustlings of night creatures. Western toads had moved into the middle of the trail, and we had to take care not to step on them. They struggled in an animatronic way when I picked them up. Some of them were bigger than my fist. The summer before, I went with a biologist from the U.S. Forest Service named Charlie Crisafulli to Meta Lake, a mile down the road from the Norway Pass trailhead. “Want to see something cool?” Charlie asked, before loping off into the bushes. I scrambled after him to the lakeshore. I saw fallen logs (always the logs), the quiet lapping lake, brown earth. What was the big deal? Then I looked more closely: the earth was moving. More than moving — it was seething, writhing. What I had thought was earth was actually thousands of western toadlets, each tiny and delicate, clambering over one another, filling all space. “Pretty neat, huh?” Charlie said. Charlie laughed. I got the sense the toadlet swarm was one of his favorite Mount St. Helens party tricks. He was among the first scientists to visit the blast zone after the eruption, and he guesses he has since spent more than 3,000 nights on the mountain. Nothing goes on here that he doesn’t know about, isn’t somehow involved in. The strange story of the western toad, he said, was one of many from the eruption. The species is declining over much of its range, but not at Mount St. Helens. Toads like open habitats, which were rare here when forests were thick. Then the blast knocked down almost every tree over a 143-square-mile area. Algae thrive in newly exposed lakes and ponds, and the toads gorged. The blast also killed many of their predators, like snakes. “But it didn’t get the toads, too?” I asked. “Nope,” Charlie said. It was one of the blast’s several quirks. In mid-May, the snowpack was still deep in places, and the toads were snug in underground dens. They hopped out into a transformed world, where debris blocked creeks and streams to create more than 100 new lakes and ponds to explore. Other organisms survived, too: young conifers pressed flat under the snow, ants sheltered under logs, Pacific jumping mice hibernating in subterranean dens, trout idling in lakes shielded under a foot of ice. Charlie and his many colleagues would spend the next three decades puzzling out the dynamics of who survived, who didn’t, who returned, how and why, and what it all meant for the shattered ecological community. “Mount St. Helens upended a lot of our thinking,” he said. Earlier, he had told of another surprising character, the prairie lupine. In June of 1982, while surveying the Pumice Plains from a helicopter, he spotted one on the ground. The Pumice Plains are a 6-square-mile stretch directly north of the volcano that was buried under a layer of pumice up to 600 feet thick, which had poured from the crater in wave after scorching wave. The plains were absolutely sterile, and biologists thought it might be decades before life returned. But two years later, here was a single purple flower, surrounded by a ring of tiny seedlings. Charlie was shocked. The prairie lupine lacks the usual traits of a species quick to claim open ground. It produces a few big, heavy seeds, rather than hundreds that float away like dandelion tufts. Also, the site was higher in elevation than lupines were thought to prefer. Yet somehow one had found its way to these bare expanses. Thereafter, the wildflowers spread. They helped the ground retain water, and they enriched the soil with key nutrients like carbon and nitrogen. All of this made the Pumice Plains more hospitable for other animals and plants. Now, during the summers, the plains are awash in color — not just the light purple of lupine, but the richer purple of penstemon, the yellow of hairy cat’s ear, the red of paintbrush. A plaque marks the site of the founding lupine, but the story would repeat with other species, many showing traits no one suspected they had: the ability to grow in a blanket of ash so dense it was like concrete (fireweed), the ability to scurry over miles of hot open desert even though you weigh less than a quarter of an ounce (shrews), the ability to dig through the ash and mix it with soil to make the ground more amenable for plants (pocket gophers). At the Mount St. Helens National Volcanic Monument, visitors compare the cone to a photo of it before the eruption. The trail all but disappears on Whittier Ridge on Mount St. Helens. Thousands of dead trees still float on Spirit Lake in this 2009 photograph, taken in Mount St. Helens National Volcanic Monument, Washington. New growth in 2005, the 25th anniversary of the eruption. The next morning, Carson and I awoke in damp sleeping bags. While we waited for them to dry, we climbed a hill near small, convoluted Panhandle Lake, where we camped. Carson, who gets up exceptionally early, had found a garbage can buried under a tree during his dawn explorations. We pried off its lid to reveal a scientific cache: a musty old Forest Service shirt (Charlie’s? ), a fishing pole, a clipboard of tattered datasheets, a few unopened bags of dried fruit. “Think the fruit is still good?” I asked. After breakfast, we made our way up to Whittier Ridge. I had been anticipating this part of our trip in a not terribly eager way. It’s a two-mile scramble, with steep drops-offs to either side of a long knife-edge, and the Washington Trails Association calls it “The Scariest Hike in Southwest Washington.” Carson and I spent more than two hours on the traverse. At one point, as we plotted a course around a hulk of rock, we heard an ominous clatter of stones. We risked a peek over a cliff, and saw a female mountain goat and her kid skip lightly away on impossible hoof-holds. “Bastards,” I muttered. My ankles ached from the torque. Still, we were richly rewarded. With nary a cloud in the hemisphere, we watched snow peaks pop up and down from behind nearby ridges like gophers. There was Mount Rainier, grand and round, and near that the rumpled Goat Rocks, and to the east Mount Adams. South of us was the sharper, hooked profile of Mount Hood, with Mount Jefferson dimly visible over 100 miles away. Mount St. Helens loomed, of course, dominant because of its proximity, but still the smallest of the bunch. “These views!” Carson said, exulting in this excerpt of the Cascades Ring of Fire. “The trees are so short it’s like being in the high alpine, and we aren’t even at 6,000 feet.” Carson likes to play outside more than anyone I know, but he hasn’t spent much time at Mount St. Helens, even though he lives a couple of hours away. I asked why. “Oh, no good reason,” he said. “Part of it is it’s easy to feel like you know the place well enough already.” The volcano’s history is so thoroughly commemorated, from roadside placards to jars of ash for sale on Craigslist, that it sits at a peculiar intersection between recreation and tourism, the familiar and the strange. “Also,” he said, “you aren’t allowed to do as much here as you can at other mountains.” The Mount Margaret Backcountry is the only place anyone can legally camp in the blast zone, and just 32 people are allowed at a time at designated sites. Save for the scientists like Charlie who work here, it is hard for anyone to have a casual, intimate relationship with Mount St. Helens, the way people did before all the recreational infrastructure — lodges, cabins, other camps — was obliterated. The event that makes the landscape so singularly compelling is what keeps the public from getting close to it again. The monument has unprecedented ecological value as an outdoor laboratory, and by unspoken implication its delicacy requires strict provisions to protect it. But this does not seem like particularly delicate land. For all the charming anecdotes about individual species and their pluck, the message from the blast zone’s wider community is less heartwarming. Before the eruption, for instance, biologists thought the process of ecological succession was an orderly one. Some species were innately better suited to the conditions created by a massive disturbance. They would do well for a while, and then another suite of species would move in and displace them, and then another, until the community stabilized. The theory was old and well-established, until Mount St. Helens showed that all those rules might not be rules at all. One of the most important findings to come from the eruption was that survivors, whether plant or animal, could have a tremendous influence on a system as it reassembled. There was nothing special about them other than the fact that they were there, yet they helped rebuild the landscape we were hiking through. Their success isn’t a dark side to the Mount St. Helens story, but it is more complicated than the sunnier tales of resilience I often hear. Biologists use words like “chaos” and “lottery” to describe what they saw in the blast zone, and Charlie never, ever says “recovery.” Once the ash settled, there would be no long arc bending towards the restoration of everything that had been killed. The whole event was defined by chance, its outcomes largely haphazard and contingent. To walk near the volcano was to walk through a naive landscape, with a host of creatures that just saw their opening and took it. 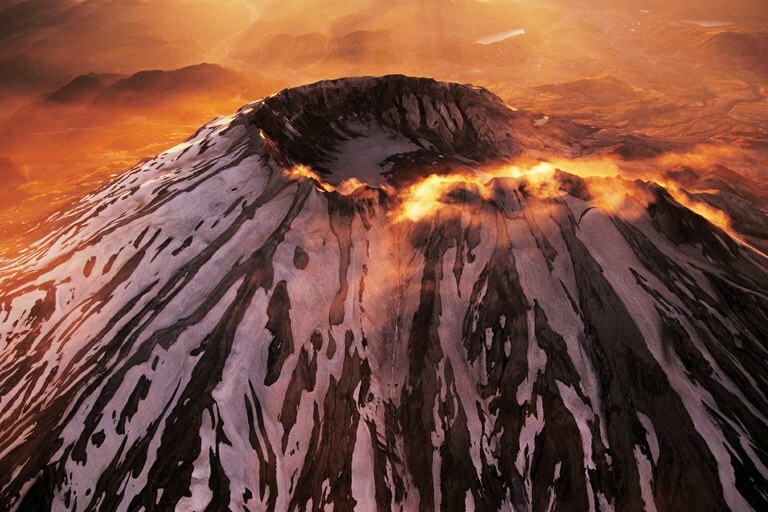 The setting sun illuminates dust rising from the crater on Mount St. Helens, about 20 years after its initial eruption. Carson and I reached Coldwater Lake by late afternoon. We were tired from the long day, and after dinner it was a relief to spread sleeping bags under a cold, depthless sky. When we woke the next morning, we were surrounded by thick fog, unable to see more than a few feet in front of our faces. We ate quickly, packed, and began the long hike back to our cars, returning the way we came. The day warmed and the fog lifted. Soon, we were retracing sections of trail we had walked earlier, with Mount St. Helens presiding over us. I felt like we were being ushered out. We made it to the parking lot a few hours later, washed the dust off, said our goodbyes. As I drove away, I switched on the radio. There were no catastrophes, no disasters, thank heavens, just a relentless series of bulletins from the presidential campaign trail, each with its own cast of outsized characters. I hit “seek” until I found a station playing classical music. Decades later, he has understood her response. I’ve always liked Snyder’s lesson, but I also never thought it was meant for me. I was 2 when Mount St. Helens erupted. I have no memory of its older beauty, knowing it only as it is today, in these times. I suppose I am also less interested in drawing a moral from the mountain, the cause of so massive a disturbance. Instead, I wanted to hear from the animals and plants that endured the aftermath, who went to sleep in one world and woke in another. The flowers shivering in the wind, the chipmunks scuttling over logs, the mountain goats dancing down cliffs. What do they say? There will be upheaval. The things of which you felt most sure can fail. Many will suffer. Many will die. Perhaps you will not. If somehow you are spared the worst, do not think it is due to any special virtue. It was nothing more than luck or circumstance. Accepting that, what will you do to help make the world that is to come? Now, prepare yourself. You are about to be tested. Eric Wagner writes about science and the environment from Seattle, Washington. He's currently writing a book about Mount St. Helens.